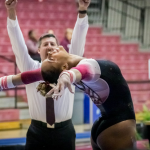 While the results from Friday’s competitions will be used to determine individual qualifiers in the all around and on the four events for nationals, we won’t know until Saturday at the conclusion of the regional final which gymnasts will advance. However, we do know those whose hopes are still alive for a trip to Fort Worth. 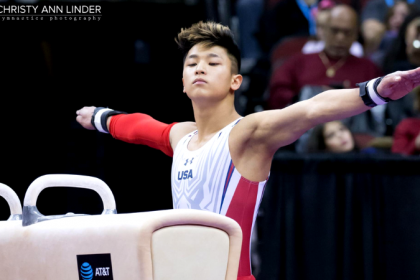 To refresh, to make it to nationals as an individual, a gymnast has to be the top competitor on an event or in the all around, not from a qualifying team. 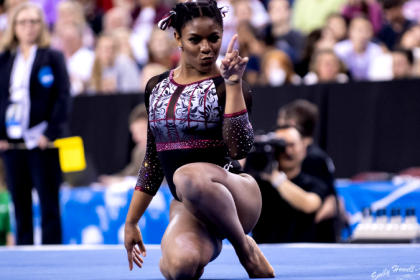 Simply, add Friday’s two sessions’ results together and scratch out all names of gymnasts from the two teams that advance out of Saturday’s regional final. Below, you’ll find those gymnasts still in contention from each regional. For a full explanation on the new postseason format, including how ties are broken, click here. Also, note that all information below is unofficial. For an official announcement on individual qualifiers, tune into the award ceremony after the conclusion of the regional final Saturday night. *Wojcik would win the tie break, if necessary: Both Wojcik and Guerra have the same four-judge average, as well as the same head judge tie break, forcing the procedure to go to NQS. Wojcik has a higher NQS with a 9.955 to Guerra’s 9.850. *Garcia would win the tie break, if necessary: Her four-judge average is 9.9125, Karas’ is 9.900 and Mahoney’s is 9.875. *Ohashi would win the tie break over Ross, if necessary: While tied on four-judge average and head judge score, Ohashi’s NQS is higher than Ross’. **Bastardi would win the tie break, if necessary: Her four-judge average is 9.900, which is higher than all the other gymnasts that scored 9.900. *If UCLA advances but Nebraska doesn’t, Crouse would win the tie break over all the gymnasts with 9.900. If UCLA does not advance but Nebraska does, Kramer would win the tie break. If neither UCLA nor Nebraska advance, Kramer would win the tie break due to having a higher floor NQS than Crouse. If both UCLA and Nebraska advance, Armbrect would qualify based on a higher four-judge average. If UCLA and Michigan advance as teams, the individual qualifiers are: Crouse (Nebraska, all around), Houchin (Nebraska, vault), Garcia (Penn State, bars), Bastardi (Penn State, beam) and Armbrecht (Alabama, floor). If UCLA and Alabama advance as teams, the individual qualifiers are: Crouse (Nebraska, all around), Houchin (Nebraska, vault), Garcia (Penn State, bars), Bastardi (Penn State, beam) and Wojcik (Michigan, floor). If UCLA and Nebraska advance as teams, the individual qualifiers are: Wojcik (Michigan, all around), Guerra (Alabama, vault), Garcia (Penn State, bars), Bastardi (Penn State, beam) and Armbrecht (Alabama, floor). If Michigan and Alabama advance as teams, the individual qualifiers are: Crouse (Nebraska, all around), Ross (UCLA, vault/bars), Ohashi (UCLA, beam) and Kramer (UCLA, floor). If Michigan and Nebraska advance as teams, the individual qualifiers are: Pedrick (Central Michigan, all around), Ross (UCLA, vault/bars), Ohashi (UCLA, beam) and Kramer (UCLA, floor). If Alabama and Nebraska advance as teams, the individual qualifiers are: Wojcik (Michigan, all around), Ross (UCLA, vault/bars), Ohashi (UCLA, beam) and Kramer (UCLA, floor). *If California and Georgia advance, Lehrmann would win the tie break over Nichols. If California and Oklahoma advance, Lukacs would win the tie break over Snead. *If Georgia and Oklahoma advance, Nixon would advance over Porter due to a higher NQS. If Georgia does not advance, Al-Hameed would advance over Nixon and Porter due to a higher NQS. *Kelly would win the 9.875 tie break, if necessary: Her four-judge average is the same as Woolfolk, but her head judge score is a 9.900 while Woolfolk’s is a 9.850. *Dukes would win the 9.900 tie break, if necessary: Her’s and Sievers’ four-judge average and head judge score are higher than Korth’s and Huang’s, and her NQS is higher than Sievers’. If Oklahoma and Georgia advance as teams, the individual qualifiers are: Hyland (Kentucky, all around), Clausi (California, vault), Nixon (Kentucky, bars), Kelly (Missouri, beam) and Dukes (Kentucky, floor). If Oklahoma and Kentucky advance as teams, the individual qualifiers are: Porter (Missouri, all around), Lukacs (Georgia, vault), Al-Hameed (Georgia, bars) and Vega (Georgia, beam/floor). If Oklahoma and California advance as teams, the individual qualifiers are: Hyland (Kentucky, all around), Lukacs (Georgia, vault), Al-Hameed (Georgia, bars) and Vega (Georgia, beam/floor). If Georgia and Kentucky advance as teams, the individual qualifiers are: Dowell (Oklahoma, all around), Lehrmann (Oklahoma, vault), Nichols (Oklahoma, bars), Woodard (Oklahoma, beam) and Trautman (Oklahoma, floor). If Georgia and California advance as teams, the individual qualifiers are: Dowell (Oklahoma, all around), Lehrmann (Oklahoma, vault), Nichols (Oklahoma, bars), Woodard (Oklahoma, beam) and Trautman (Oklahoma, floor). If Kentucky and California advance as teams, the individual qualifiers are: Dowell (Oklahoma, all around), Lukacs (Georgia, vault), Nichols (Oklahoma, bars), Vega (Georgia, beam), Trautman (Oklahoma, floor). *Ramler would win the tie break, if necessary: Ramler and Watson both have 9.900 and 9.875 for their two highest scores, but Ramler’s third-highest score is a 9.850 while Watson’s is a 9.825. *Gobourne would win the 9.950 tie break, if necessary: Both Loper’s and her four-judge averages are the same, but Gobourne’s head judge score is a 9.950 vs. Loper’s 9.900. Skinner would win the 9.900 tie break, if necessary. *Garner would win the 9.950 tie break, if necessary: Her four-judge average is higher than both Milliet’s and Edney’s. *Skinner would win the 9.900 tie break, if necessary: Her NQS is higher than Kelley’s. If LSU and Utah advance as teams, the individual qualifiers are: Ramler (Minnesota, all around), Gobourne (Auburn, vault), Cairo Leonard-Baker (Arizona State, bars), Garner (Arkansas, beam) and Carter (Arkansas, floor). If LSU and Auburn advance as teams, the individual qualifiers are: Skinner (Utah, all around), Loper (Minnesota, vault), Cairo Leonard-Baker (Arizona State, bars), Garner (Arkansas, beam) and Carter (Arkansas, floor). 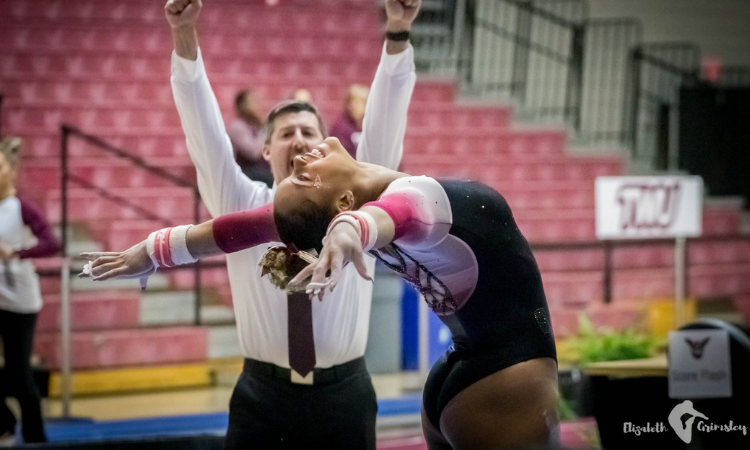 If LSU and Minnesota advance as teams, the individual qualifiers are: Skinner (Utah, all around), Gobourne (Auburn, vault), Cairo Leonard-Baker (Arizona State, bars), Garner (Arkansas, beam) and Carter (Arkansas, floor). If Utah and Auburn advance as teams, the individual qualifiers are: Edney (LSU, all around), Loper (Minnesota, vault), Cairo Leonard-Baker (Arizona State, bars), Finnegan (LSU, beam) and Kelley (LSU, floor). If Utah and Minnesota advance as teams, the individual qualifiers are: Edney (LSU, all around), Gobourne (Auburn, vault), Cairo Leonard-Baker (Arizona State, bars), Finnegan (LSU, beam) and Kelley (LSU, floor). If Auburn and Minnesota advance as teams, the individual qualifiers are: Skinner (Utah, all around), Harrold (LSU, vault), Cairo Leonard-Baker (Arizona State, bars), Finnegan (LSU, beam) and Kelley (LSU, floor). *Brown would win the tie break over Karr, if necessary. Bryant would win the tie break over Means, if necessary. *Karr would win the tie break, if necessary, because she had a higher four-judge average than the other 9.850s. *Karr would win the tie break, if necessary, then Gill over Thomas, all due to four-judge averages. *Vasquez would win the tie break over Boren, if necessary, due to a higher NQS. Lowrey would win the 9.900 tie break, if necessary, due to having a higher four-judge average. *Brown would win the tie break over Thomas, if necessary, due to a higher four-judge average. If Florida and Denver advance as teams, the individual qualifiers are: Bryant (Stanford, all around), Jacobsen (Oregon State, vault), Gill (Oregon State, bars), Lazaro (Oregon State, beam) and Ward-Sessions (Utah State, floor). If Florida and Oregon State advance as teams, the individual qualifiers are: Brown (Denver, all around), Karr (Denver, vault/bars), Vasquez (Denver, beam) and Ward-Sessions (Utah State, floor). If Florida and Boise State advance as teams, the individual qualifiers are: Brown (Denver, all around), Jacobsen (Oregon State, vault), Karr (Denver, bars), Vasquez (Denver, beam), Ward-Sessions (Utah State, floor). If Denver and Oregon State advance as teams, the individual qualifiers are: Boren (Florida, all around), Schoenherr (Florida, vault), Thomas (Florida, bars/floor) and Baumann (Florida, beam). If Denver and Boise State advance as teams, the individual qualifiers are: Boren (Florida, all around), Schoenherr (Florida, vault), Gill (Oregon State, bars), Lazaro (Oregon State, beam) and Thomas (Florida, floor). If Oregon State and Boise State advance as teams, the individual qualifiers are: Brown (Denver, all around), Schoenherr (Florida, vault), Karr (Denver, bars), Vasquez (Denver, beam) and Thomas (Florida, floor). and if florida and osu advance, the gal from denver goes on floor, not the gal from utah state.